The local band Waltham played some songs off their new album at a recent in-store appearance. Throughout the performance, this kid in the crowd was singing along to all the songs. He was doing more than just singing the songs too, he was belting them out! Halfway though the last song, All I Want Is You, Frank Pino, lead singer of Waltham, invited this kid up to share the mike. It was one of those rock and roll moments that really leaves an impression. 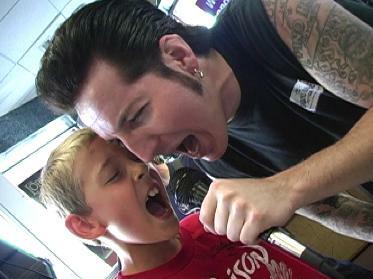 You've got Frank, the tatooed lead singer of a rock and roll band, pulling a kid, who's wearing a Poison T-Shirt, up on stage to sing along. Turns out that this kid's name is Frank too. Little Frank wants to grow up to be a singer and says, "Frank knew me since I was born." That explains chemistry that everyone could see happening in front of them as Frank and Frank sang each word of the song totally in sync with each other. For me, as a video producer, it was even more amazing to be there at that moment to get it on tape!